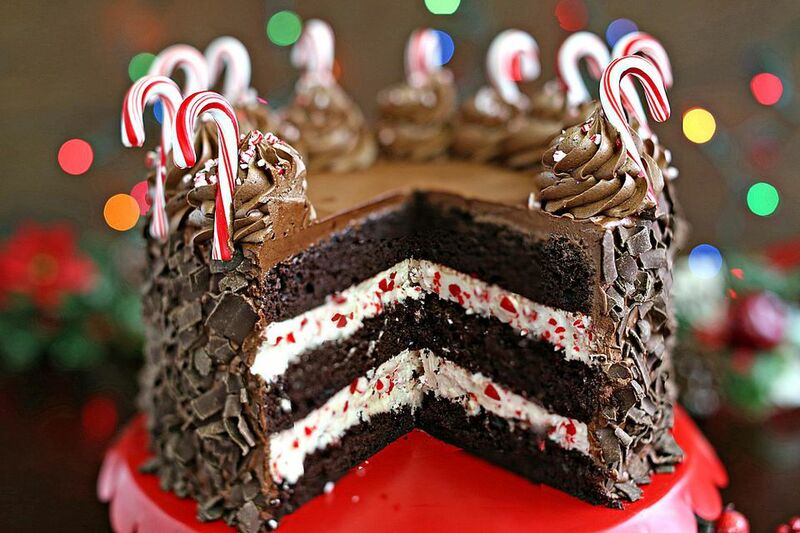 If you love the combination of chocolate and peppermint, this Chocolate Candy Cane Cake is for you! Three moist layers of chocolate cake surround candy cane buttercream, and the whole thing is frosted with chocolate-mint frosting. A layer of chocolate curls and some mini candy canes give it the perfect finishing touch! The candy cane pieces in the buttercream do tend to get sticky after about a day, so if you're wanting to make this in advance, I suggest swapping the candy cane pieces for Andes peppermint crunch baking bits, or similar chocolate-mint pieces, instead of using sugar-based mint candies. If you make this swap, this cake keeps very well in the refrigerator for 3-4 days. Bring it to room temperature before serving! A quick note about the frosting ingredients: this recipe calls for pasteurized egg whites. It is safe to consume egg whites without cooking them, as long as you make sure that the whites you buy are pasteurized. To save time, I buy them in a carton--look for 100% egg whites, not liquid egg substitute. If you cannot find them in a carton, you can buy pasteurized eggs and separate them yourself. You’ll need about 5-6 large eggs to get the ¾ cup called for in the recipe.